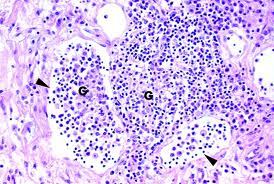 Acute Nephritic Syndrome (postinfectious glomerulonephritis, acute glomerulonephritis) is a medical condition in which glomeruli inflammation that is causing abrupt blood appearance in the urine, with variable protein amounts and casts (red blood cells clumps), occurs. 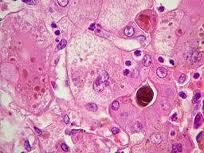 Acute Nephritic Syndrome can be caused by a streptococcal infections including strep throat. 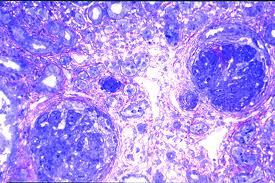 In this case, the disorder is known as Poststreptococcal Glomerulonephritis. Acute Nephritic Syndrome can be also resulted from reactions to other infections, including malaria, prosthesis (infection of an artificial part of body), syphilis, hepatitis, chickenpox, abdominal organ abscess, pneumonia, and bacterial endocarditis. 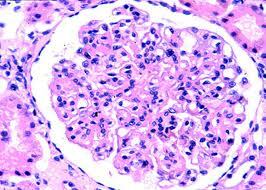 About 50% of individuals with Acute Nephritic Syndrome experience no symptoms. When symptoms do exist, the first to happen are edema (retention with swelling of tissue), dark urine with blood, and low urine volume. Edema can first appear as puffiness of the eyelids and face, but later it occurs in legs; and edema can become severe. Brain swelling and high blood pressure can cause serious brain function disturbances, visual disturbances, and headaches. The urine laboratory analysis of the urine shows variable protein amounts and the 2 waste products such as creatinine and urea in the blood is frequently high. The doctor investigates the Poststreptococcal Glomerulonephritis possibility in patients whose results of the laboratory analysis shows kidney disfunction after a culture-proven streptococcal infection, impetigo or sore throat, and patients with developed Poststreptococcal Glomerulonephritis. Acute Nephritic Syndrome caused by infectious organisms other than streptococci is generally easier to diagnose because its symptoms frequently start while the infections are still obvious. Most individuals with Acute Nephritic Syndrome recover fully. However, if laboratory analysis determines large protein amounts in the urine or a rapid kidney function decline, lasting kidney damage and kidney failure may happen. In approx. 1% of children and 10% of adults, an acute nephritic syndrome evolves into quickly progressive nephritic syndrome. An estimated 85 to 95% of children regain normal function of the kidney, but can be at higher risk of progressing high blood pressure later. 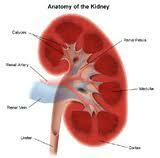 Approx 40% of adults do not recover fully and continue to have abnormalities of the kidney function. No treatment exists in the most of cases. If a bacterial infections are still present at the time when acute nephritic syndrome is found, antibiotic therapy is begun. If Acute Nephritic Syndrome is caused by an infected part of the artificial body, such as a heart’s valve, the prognosis is good as long as the infections may be eradicated. Eradication frequently needs removal and replacement of the artificial part combined with antibiotic therapy. Diet consisting of low salt and protein can be required until kidney function recovers. Diuretics can be prescribed to help the kidney excrete excess water and salt. High blood pressure can be treated with medications. Patients with progressed kidney failure can require dialysis.